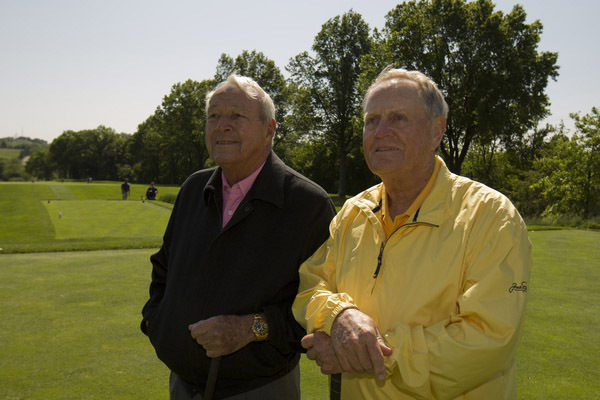 Far Hills, N.J. – Golf legends Jack Nicklaus and Arnold Palmer have been named honorary co-chairmen of the 116th U.S. Open Championship, to be contested at Oakmont (Pa.) Country Club, June 16–19, 2016. The duo made golf history at the Pittsburgh area course in 1962, when Nicklaus, 22, defeated Palmer in an 18-hole playoff to win his first major championship, and the first of four U.S. Open Championships. Nicklaus was recently honored by the USGA with the opening of the Jack Nicklaus Room in the USGA Museum at the association’s Far Hills, N.J., headquarters. Beyond his record 18 major-championship victories and 120 professional wins worldwide, Nicklaus captured 73 PGA Tour victories as well as two U.S. Amateurs and two U.S. Senior Opens. In 1975, he won the Bob Jones Award, the USGA’s highest honor. He was awarded the Presidential Medal of Freedom in 2005 and the Congressional Gold Medal in 2015. The U.S. Open gold medal, given to all U.S. Open champions, was named the Jack Nicklaus Medal in 2012. With 92 professional victories and seven major championships, Palmer became the pride of Pennsylvania with his three USGA titles: the 1954 U.S. Amateur, 1960 U.S. Open and 1981 U.S. Senior Open. His long relationship with the association also includes the 1971 Bob Jones Award. The honorary chairman of the USGA Members Program since its inception in 1975, he dedicated the newly renovated USGA Museum and Arnold Palmer Center for Golf History in 2008 in Far Hills. Among Palmer’s many career accolades, he was recognized with the Presidential Medal of Freedom in 2004 and the Congressional Gold Medal in 2012. He played in his 32nd and final U.S. Open at Oakmont in 1994. In their honorary roles, Nicklaus and Palmer will support the 16th USGA championship to be held at Oakmont. Spectator tickets for the 116th U.S. Open Championship are available at usga.org, along with corporate hospitality and other championship information. The USGA conducts the U.S. Open, U.S. Women’s Open and U.S. Senior Open, as well as 10 national amateur championships, two state team championships and international matches, attracting players and fans from more than 160 countries. Together with The R&A, the USGA governs the game worldwide, jointly administering the Rules of Golf, Rules of Amateur Status, equipment standards and World Amateur Golf Rankings. The USGA’s reach is global, with a working jurisdiction in the United States, its territories and Mexico, serving more than 25 million golfers and actively engaging 150 golf associations. The USGA is one of the world’s foremost authorities on research, development and support of sustainable golf course management practices. It serves as a primary steward for the game’s history and invests in the development of the game through the delivery of its services and its ongoing “For the Good of the Game” grants program. Additionally, the USGA’s Course Rating and Handicap systems are used in more than 50 countries on six continents.